Senior Learning and Performance Consultant, DeakinCo. As a designer of learning solutions influenced by the 70:20:10 framework, I've found myself increasingly using the concept of workflow learning to inspire, explain and frame my approach. It's a framework I now implicitly refer to during the design thinking co-design process I use, and it has shaped the sorts of blends, campaigns and ecosystems that are generated from that process. I've captured the essential elements of this model in the above diagram. Workflow learning is framed by the dynamic interplay between behaviour and mindset. As I've described it in the diagram, it places experience at the heart of the model and prioritises its interplay with a conscious process of reflection that bounds it. That's worth emphasising because, in my opinion, the relationship between experience and reflection is the key driver of learning and change. Everything else, from training and performance support to social learning, supports and scaffolds that key relationship. Let's dive in to see what this means for each element, starting with the two most important ones of experience and reflection. Experience, based on behaviour and context, is the starting point and heart of workflow learning. It's the primary anchor and the prism through which other elements are viewed. This starting point is an acknowledgement that work is learning. Further, it reflects the understanding that most learning happens when we are at the edge of our comfort zone, embarking on stretch projects where new challenges demand new mindsets and behaviours. As long as the stretched comfort zone doesn't snap, the result is an increase of capability and an expanded comfort zone moving forward. I find Mihaly Csikszentmihalyi's theory of flow to be a useful point of reference in striving for that zone of engagement that lies between anxiety and boredom. Structured action-learning projects and stretch assignments can support engaging experiences, but it's ultimately about the approach of the individual and organisation. Real gains require a personal growth mindset where the individual is motivated and curious to experiment and improve, supported by an organisational culture that embraces failure as an intrinsic part of innovation and growth. As John Dewey famously pointed out, we do not learn from experience—we learn from reflecting on experience. · mental models, or the conceptual frameworks and high-level linkages that are made between various experiences and elements. Stanford University's Carol Dweck's work on fixed and growth mindset has popularised the concept of mindset. Although her research points to mindset developing through childhood experiences and environment, she notes that it can be actively developed, even by adults. When we listen to our 'internal voice', which is representative of mindset, and positively engage with and redirect that voice, this requires a deliberate and sustained reflective process (not to mention buckets of patience and self-compassion). Similarly, reflecting on experiences with the view to challenging our mental models is a crucial part of learning and unlearning. This process might start with basic questions about recent experiences—such as 'What did I do, what would I do differently, and what are my takeaways? '—and lead to fundamental questions that enable us to reconcile our world view with the constant reality check of experience. Over time, such an open, reflective process might call into question things we assumed to be true, as old and new mental models fight for their place in our minds. In such cases, the process of unlearning and letting go of redundant mental models is just as important as developing new models moving forward. My last word on this is that, in my experience, an effective reflective practice is inherently linked to a culture of investigation and research. There's a place for regularly and mindfully asking reflective questions while staring out the window, but the process of diving into the web, pulling in resources and creating mini-experiments to explore and validate ideas can also be crucial to support change. 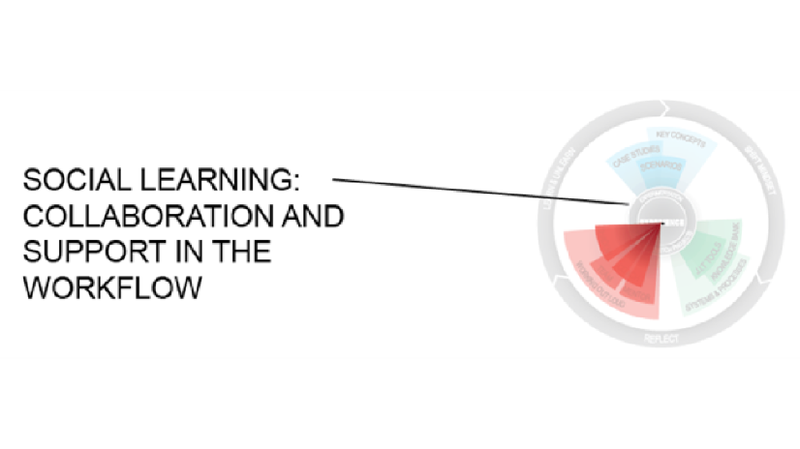 Formal training is by no means the most important factor that lies between mindset and behaviour, but I've placed it at the top of the diagram because it's the entry point for most learning and development professionals. key concepts to provide new mental models and frameworks to incorporate into the reflective process. That leads to training focused on scenarios and role plays that place the learner in simulated but contextualised and authentic challenges. This might take a multitude of forms, including a written scenario that is debated via a discussion forum; a branched elearning module; role-plays in a face-to-face workshop; or even an immersive virtual reality simulation. 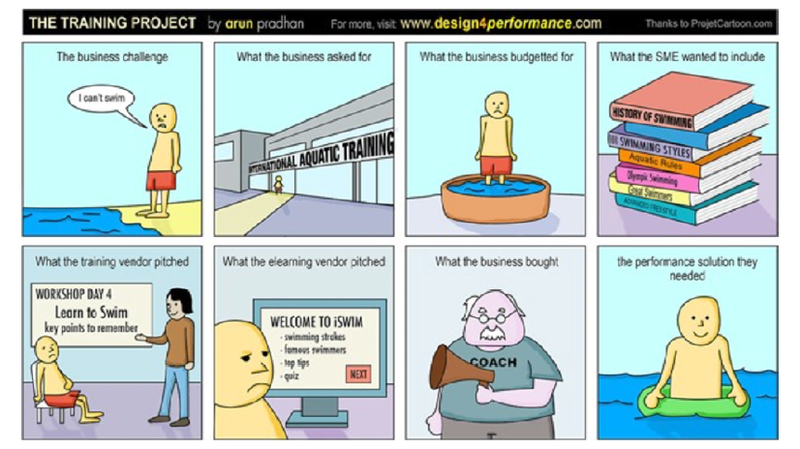 The next level of engagement is case studies. Using narrative to explore real-life challenges helps engagement by establishing real-world relevance. Such case studies will ideally include moments in the narrative to actively engage with learners, asking what would they do in that situation and how it relates to their own experience, supporting both reflection and context-based application. On a slightly different tangent, training can help shed light on key concepts and mental models that inform the reflective process, and it supports a deliberate approach to learning and unlearning. This is particularly important for experienced practitioners and experts who have developed intrinsic understanding and abilities but might lack a 'balcony view' of what and how they are doing—and therefore how they might improve. I've found that key concepts are often best introduced via infographics; short and punchy written pieces; or motion-graphic explainer videos. Metaphors and narratives can help create context and make concepts easily digestible. Simple, visual, and quick tend to be my watchwords here. It helps to design these interactions with the view that they will be given context in an experience, coaching session or just-in-time moment rather than viewing them as standalone items that require mountains of context and background. Finally, although I haven't noted it in the diagram, another role of training is to support engagement in a change process. Campaign-styled assets capturing key WIIFM (what's in it for me) messaging around learning and performance objectives can help to support that ever-crucial buy-in from the learner. After all, whether someone learns and changes is ultimately their decision. With a focus on the experiential, social learning asks, 'How can people, teams and communities support this person to reach the required outcome in the workflow?' That means the most effective social learning is inherently performance-focused and collaborative. 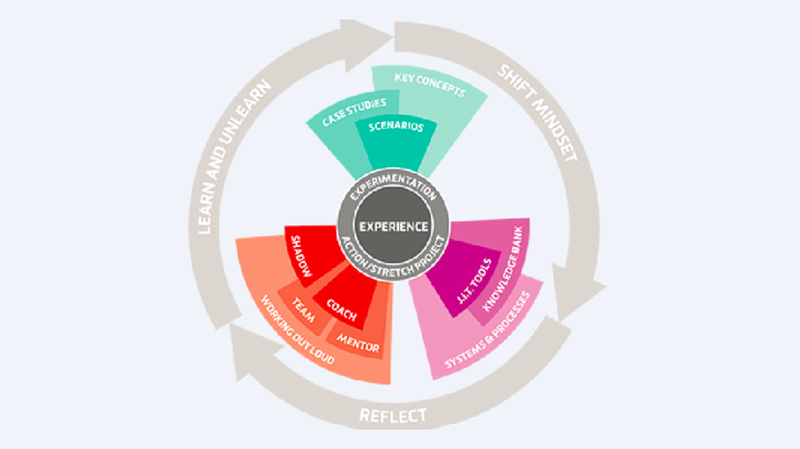 Coaches play a crucial role in the midst of experience, both in supporting a solution-seeking mindset in response to challenges and in embedding a personal reflective culture. Mentors, like case studies in formal training, can provide inspiration and narratives that can be learnt from and applied to new contexts. Beyond that, diverse teams that bring a variety of mental models and mindsets to the table contribute to developing self-awareness and reflective practice. Collaboration with contrasting approaches and attitudes can help us to become aware of and refine our own mental models, mindsets and behaviours. All this is encompassed in working out loud (WOL). Far from an optional extra, WOL helps to reveal workflows and provides greater opportunities for social and collaborative input. The internal process of consciously sharing and engaging with peers and communities also supports reflection and growth. Last but definitely not least comes performance support, perhaps the most powerful yet ignored tool in our arsenal. I often half-jokingly explain that the role of learning and development should be to kill knowledge—a bit provocative, maybe, but what I'm really striving for is to reduce cognitive load and stop weighing down people with facts and information so that their minds can be freed up for the important stuff of thinking, creating and problem-solving. In a world where a kid with a smart phone can out-fact a Mensa convention, why wouldn't we use the tools around us to minimise redundant learning and support people to use shortcuts, technology and systems to reach their performance outcomes? Performance support might come in the form of simple yet powerful checklists (if you doubt the powerful aspect, check out the Checklist Manifesto); micro-learning videos that support just enough learning, just in time; or an intuitive knowledge management system (KMS) that presents knowledge totally integrated into the workflow. In a perfect world, we wouldn't need to categorise and compartmentalise learning elements, because they are ultimately all bound together and entwined in a complex mesh. That said, from an industry perspective, learning professionals have commoditised and now deliver formal training to the near-exclusion of all else. In that context, I believe 70:20:10 is more relevant than ever. Workflow learning, as I've described it, is not a break from 70:20:10. Rather, it's another way to support much-needed realignment within learning and development, best captured by Charles Jennings when he challenged us to 'start with 70 and plan for the 100'. The model I've outlined helps me to focus on experience first and approach everything else (formal learning, social learning and support) through that prism. I share it here in the hope that others find it useful and that, through the discussion that might follow, it can be improved.